Have you had a pyjama day recently? I rarely get the chance to spend all day in my jim jams, but when I do there's nothing I like more than a pair of the softest woolly socks to team with some fluffy slippers as I take things easy ... really, really easy. So if you're looking for a suitably indulgent pair of socks to team with your Uggs, then look no further. And the good news is that they're really easy to make. 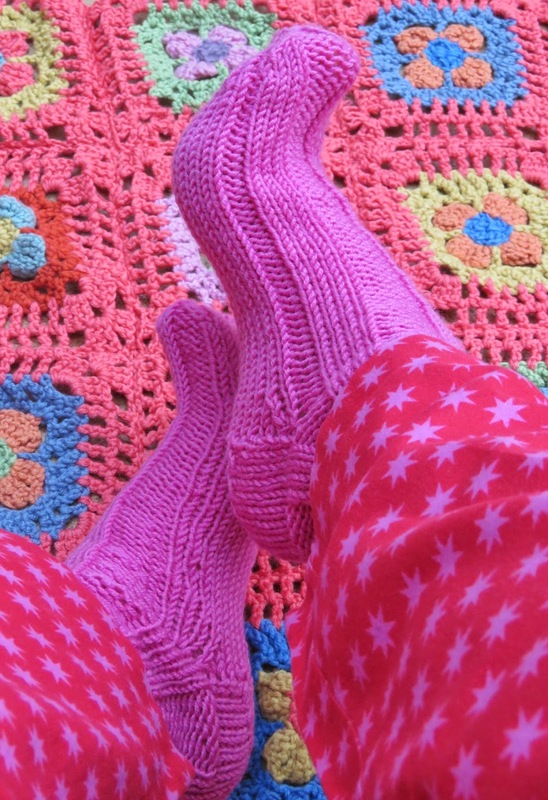 Moreover using double knitting wool instead of 4 ply, and knitting on 4 mm double pins turns them into a super quick project that you could easily knock out over a wet weekend. Want to give them a go? Then read on for the pattern. Needles 1 and 3 will form the heel (when the time comes) and needle 3 will be the instep, and you just knit around in circles using the fourth needle. 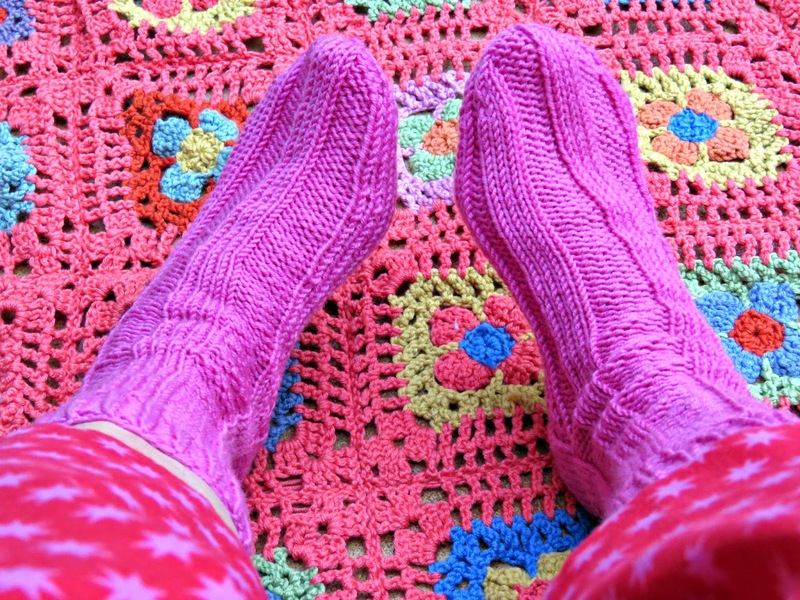 If you'd like to get a more detailed explanation of sock anatomy, check out my post about How to Knit the Very Easiest Snuggly Socks. Be careful at the beginning when you close your first row not to get the knitting twisted. It's important to have the material straight all the way round. Now knit the cuff at the top of the sock: knit 1, purl 1 all the way round until your cuff is as long as you'd like it to be. 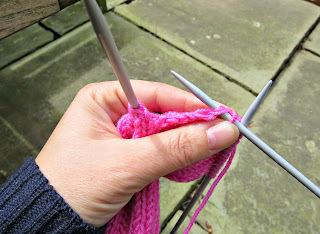 I like mine to measure about 4 cm, which on these needles is about 10 rows. You can mark the end of the row with a row marker so that you know where you are, but I just watch out for the long tail from my initial cast-on, which marks the end of my rows. Having knit the cuff you then need to knit the leg. I've chosen a big bold ribbing for these legs. 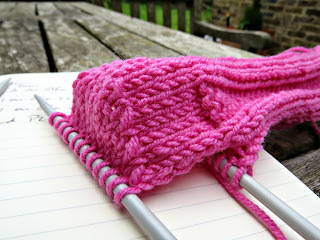 It's also very easy: knit 4, purl 4 all the way round. picking up and continuing the count as you move from one needle to the next. Just keep going until your leg's as long as you'd like it to be. On these ones I kept going until the leg and cuff together measured 17 cm. Then I got going on the heel. When you've finished your last leg row, purl back across needle 3 in the opposite direction to begin working the heel. Row 1: Slip 1 knit wise, and then knit all the stitches across needle 3 and needle 1 i.e. slip 1 knit-wise and knit 19. Remember while you're working on the heel the instep stitches on needle 2 are having a holiday: you work only with needles 1 and 3. Row 2: Slip 1 purl wise, and then purl across all the stitches on needles 1 and 3 i.e. slip 1 purl-wise, purl 19. Repeat rows 1 and 2 above 4 times i.e. 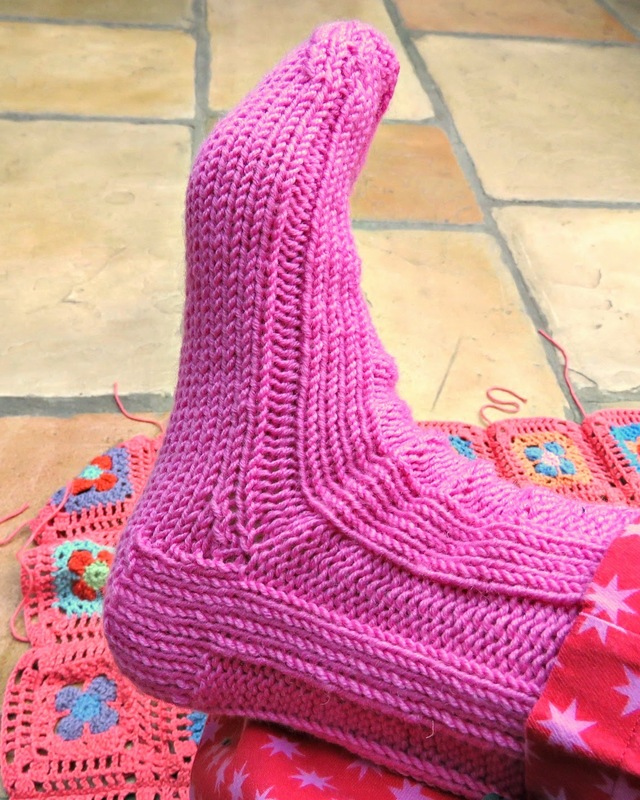 you will effectively work 8 rows to knit the heel. Having knit the heel you now have to turn it. Row 1: Slip 1 knit-wise, Knit 10, Slip 1 knit-wise, knit 1, pass slipped stitch over knit stitch, knit 1. Turn. i.e. Sl1 KW, K10, Sl1 KW, K1, PSSO, K1. Turn. At this point you will have 6 stitches on needle 1 that have not been touched, and there will be a total of 19 stitches across needles 1 and 3. At this point you will have 5 stitches left unworked on needle 3, and there will be a total of 18 stitches across needles 1 and 3. Row 3: Slip 1knit-wise, Knit 5, Slip 1 knit wise, knit 1, Pass slipped stitch over knit stitch, knit 1. Turn. i.e. Sl1 KW, K5, Sl1 KW, K1, PSSO, K1. Turn. At this point you will have 4 stitches left unworked on needle 1, and there will be a total of 17 stitches across needles 1 and 3. At this point you will have 3 stitches left unworked on needle 3, and there will be a total of 16 stitches across needles 1 and 3.
i.e. Sl1 KW, K7, Sl 1 KW, K1, PSSO, K1. Turn. At this point you will have 2 stitches left unworked on needle 1, and there will be a total of 15 stitches across needles 1 and 3. At this point you will have 1 stitch left unworked on needle 3, and there will be a total of 14 stitches across needles 1 and 3.
i.e. Sl1 KW, K9, Sl 1 KW, K1, PSSO, K1. Turn. At this point you will have worked all the stitches on needle 1, and there will be a total of 13 stitches across needles 1 and 3. At this point you will have worked all the stitches on needle 3, and there will be a total of 12 stitches across needles 1 and 3. Now we need to pick up the stitches between the heel and the instep and shape the gusset. Knit back across the 12 stitches remaining from needles 1 and 3. Then, using the free needle, pick up 6 stitches across the side of the heel by knitting into the stitches that were slipped at the start of each of the heel rows. Carry on knitting in pattern across the instep stitches on needle 2. Their holiday has ended and they're back in play again. Then when you've worked your way across the instep stitches on needle 2, pick up another 6 stitches by knitting into the stitches that were slipped at the beginning of each row on the other side of the heel. Now have a little play with the stitches on needles 1 and 3. Shuffle them along, slip them from needle to needle so that you have 12 heel stitches on both needles 1 and 3. Now we're ready to lose 4 stitches from needles 1 and 3 to shape the foot gusset. Needle 1: Knit across to last 3 stitches, Knit 2 together, knit 1. Needle 2 (the instep) work as normal with no decrease. Needle 3: Knit 1, Slip 1 knit wise, knit 1, pass slipped stitch over knit stitch. Knit to the end of the row. At the end of row 1 you will have 42 stitches on your needles. At the end of row 3 you will be back to 40 stitches and you will be ready to knit the foot. 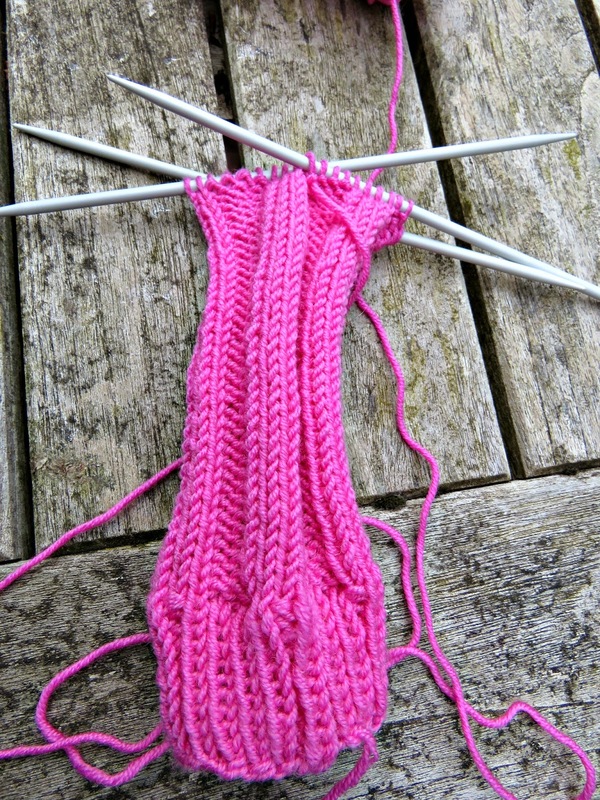 Just keep going, working needles 1 and 3 in plain knit stitch and your pattern across needle 2 until your foot measures about 4 cm less than the total length that you need for the finished sock. You're now ready to shape the toe. Needle 1: Knit to last 3 stitches. Knit 2 together. Knit 1. Needle 2: Knit 1, Slip 1 (either purl-wise or knit-wise - according to the pattern) Work another stitch in pattern. Pass the slipped stitch over the worked stitch and work to the last 3 stitches on the needle. Knit or Purl 2 together in pattern. Knit 1. Needle 3: Knit 1, Slip 1 knit-wise, Knit 1. Pass slipped stitch over knit stitch and knit to the end of the row. At the end of this row you will have 36 stitches on the needles. Row 2: knit on needles 1 and 3. Work pattern on needle 2. Repeat Row 1 again. You will now have 32 stitches on the needles. Carry on knitting row 1 on each successive row until only 12 stitches remain. Cut the wool, thread it through a darning needle and slip the remaining 12 stitches off the needles continuing in the clockwise direction that you would have carried on knitting in. Draw the wool through all 12 stitches, pull tightly, fasten and darn in the loose ends. And now you're all set to enjoy a PJ sofa-surfing day! Yep, more than once! But don't tell my mom, as I never had a pyjama (or is it pajama?) day before moving to Scotland. She would never approve. ;) Your woolly socks are so pretty, Bonny :) Sweet dreams. 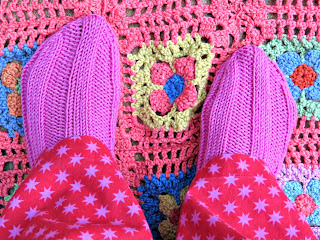 Love, love, love pyjama/pajama days! I mostly have them in the winter, rarely in the summer come to think about it. I wish I could get the hang of knitting. After repeated attempts I've given up hope. I have a pair of wool socks my mom knit for me when I was ice skating. Love them. No pattern to them like yours. And I love your PJs!